RussJones.Us: It's Beginning To Look At Lot Like . . . . It's Beginning To Look At Lot Like . . . . I can't do it. I've been trying to get into the "Christmas spirit" for the last week, and all I can muster up is a Bah Humbug. There is the Christmas spirit that seems more like being possessed by a demonic elf who is bent on blowing up your life with tinsel, Christmas cookies, and credit card debt. 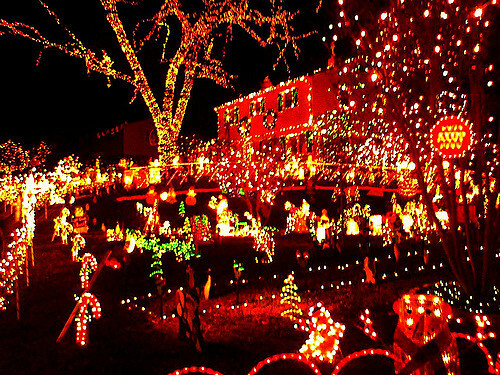 This spirit makes the power company happy with all the Christmas lights you put on your house and your neighbors angry because everyone in a 50-mile radius wants to drive by every night. There is the Christmas spirit whose only goal is to cast the demonic elf out of everyone and everything. They say things like "Jesus is the Reason for the Season" and "Having a Christmas tree is evil." They mean well but just come off being mean and uncaring. There is the Christmas spirit, oh sorry, holiday festive, cheerful person who wants to eliminate the Christ out of Christmas. They are offended at the religious overtones that this season embraces. There is the Christmas spirit who revels at the thought of what they are going to get this year. The new iPhone? How about a laptop? Those new shoes you were oohing and awing at the mall. Maybe a new truck! There is the Christmas spirit that wants to enjoy the holidays without having to wait in checkout lines, deal with holiday traffic and find a good parking place everytime you go to the store. Oh, wait - that's all of us. There it is!! That's what I've been looking for. Thanking Jesus for laying down His Divinity in heaven to be a human just like us. He came as a child because that's the way we arrived at this planet. We identify with Him because He lived His life just like us. Yea I guess my sarcastic nature is a bit off the chain. But then again, "It's Beginning To Look A Lot Like . . . No, No, No. Gloria in Excelsis Deo (Latin for "Glory to God in the highest") Why do we celebrate Christmas? To worship our Savior and Lord Jesus.